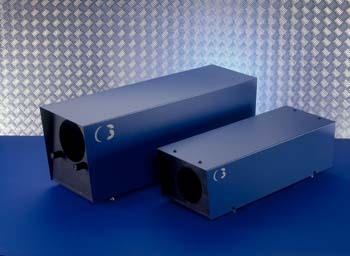 Optical Surfaces laser beam expanders incorporate off-axis mirrors which provide an unobstructed output and highly efficient transmission. The reflective design of these beam expanders is achromatic and with aluminium coatings can operate from UV to far IR without adjustment. Optical Surfaces beam expanders are portable and can be used without the need for internal re-alignment. 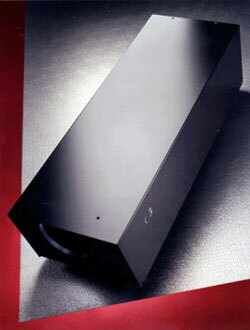 Each off-axis beam expander is housed in an aluminium housing with provision for fixing to an optical table. Alignment aids are provided to ensure correct beam pointing. Standard beam expanders have fixed magnification. Variable magnification beam expanders can be supplied with interchangeable primary mirrors. An interferogram and OPD map is supplied with every beam expander manufactured by Optical Surfaces. Optical Surfaces Ltd. have collaborated with the Remote Sensing Group at the Defence Evaluation and Research Agency (D.E.R.A., Malvern, UK) and the Civil Engineering Department of Salford University (Manchester, UK) to develop high performance off-axis beam expanders for integration into a new generation of pulsed coherent LIDAR systems. The LIDAR system was developed to measure phenomena involved in local wind fields and the dispersion of atmospheric pollution in built up city areas. In this demanding application the LIDAR directs an eye-safe pulsed CO2 laser into the atmosphere. Naturally occurring aerosol particles in the air backscatter the laser radiation and this is detected by the LIDAR receiver. The Doppler shift between the out-going and backscattered light is evaluated thereby giving the line-of-sight velocity of the aerosol scatterers which can be assumed to move with the localised wind field. The DERA site at Malvern has been involved in the development and theoretical understanding of remote sensing applications for over 30 years. With a considerable in-house expertise in theoretical physics and engineering staff familiar with building instruments, DERA have been involved in notable remote sensing projects with the UK MOD, European Space Agency, Aerospace Companies and University Research Departments. The task of having to try to measure the dispersion of airborne pollutants in a built up city environment along a clear air corridor necessitated the development of the new generation of pulsed coherent laser radar (LIDAR) system. Traditional techniques including radar and continuous wave (c.w) LIDAR were found to have notable shortfalls in trying to solve this problem. Whilst c.w LIDAR offered good spatial and spectral resolution, such systems typically measure wind velocity and turbulence at a point in space and are limited to a few hundred metres detection range. Radar was eliminated as a measurement tool mainly due to the clutter experienced close to a built up environment and the lack of clear air returns. The development of a pulsed coherent LIDAR system potentially was theorised to offer clear air detection over a distributed corridor to several kilometres range and not suffer from terrain induced clutter. The DERA design was based upon being able to build a compact and high performance monostatic system in which the same LIDAR telescope transmits and receives the laser signal. Drawing upon 30 years of international design and manufacturing experience Optical Surfaces Ltd. indicated that the required high performance and design compactness was best achieved through an off-axis parabolic beam expander. Benefiting from a stabilised manufacturing environment Optical Surfaces was able to supply a compact x15 off-axis beam expander unit with a transmitted wavefront accuracy of lambda/5 over the complete 150mm output aperture measured at 633nm. The high surface quality of the optics virtually eliminated any limitation on the performance of the LIDAR system due to telescope feedback. Operating at 120 pulses per second (500 nanosecond pulse length) the DERA LIDAR system has been able to routinely measure the wind velocity and the aerosol concentration to a range of 3 km with a range resolution of approximately 100 meters. In future it is planned to exploit the achromatic performance of the optical system, making multiple wavelength DIfferential Absorption Lidar (D.I.A.L.) measurements in this Doppler mode where species concentrations and the wind field can be simultaneously monitored with the same equipment.